Fact Check Second Presidential Debate: Hillary Clinton And Donald Trump Meet Again NPR's politics team, with help from reporters and editors from across the newsroom, live annotated the second presidential debate. Presidential candidates Donald Trump and Hillary Clinton debated Sunday night in their second official matchup. It was the first debate since audio surfaced of Trump making vulgar comments about women, causing more than two dozen in GOP leadership to defect from the candidate. NPR's politics team, with help from reporters and editors across the newsroom, live annotated the debate. Portions of the debate with added analysis are underlined in yellow, followed by context and fact checks. 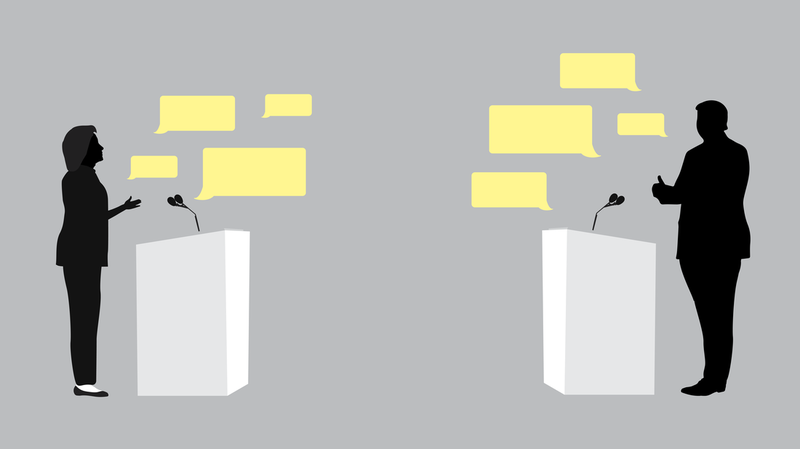 Note: The transcript was updated throughout the debate. While we are working to correct errors, it may contain some discrepancies and typographical errors. A previous version of this story incorrectly identified Clinton campaign research director as Tony Clark. His last name is Carrk. We also incorrectly stated that Donald Trump's leaked Access Hollywood video was recorded in 1995. It was recorded in 2005.